Demographically, hypotonia affects both genders equally and is no more likely to occur in one particular ethnic or racial group than another. It is one of the most common muscular abnormalities diagnosed in newborns with disorders such as Down syndrome, cerebral palsy, Prader-Willi syndrome, and Tay-Sachs disease yet, in some connective tissue disorders or certain muscular dystrophies, low muscle tone may not be revealed until later in life. Hypotonia is an associated symptom among many children with autism spectrum disorders,3,4 but typically improves over time and responds to clinical intervention. Expertise matters in both performing diagnostic studies on children, such as EMG, and assessing individual abilities, he said. In some cases, idiopathic hypotonia resolves within the first few years of childhood, though minor cognitive impairments or developmental delays may persist.5 Hypotonia caused by hormonal or metabolic disorders, such as rickets or congenital hypothyroidism, must be specifically screened for but can be easily treated. Hypotonia is a common feature of genetic disorders associated with developmental delay. Children with Angelman syndrome have gait ataxia with tremulous limbs, but may not always have hypotonia.9 Neonates with Prader-Willi syndrome (PWS), however, have severe hypotonia, evidenced by lethargy and weak or no sucking. As children grow, their gross motor skills are typically delayed; they may sit at 12 months and walk at 24 months, though in some cases walking may be delayed until they are aged 4 or 5 years. In 2010, Korean researchers found a high prevalence of spinal deformity, limb malalignment, and foot abnormality in PWS, regardless of age or obesity.11 They urged pediatric orthopedic surgeons to evaluate PWS patients annually for these conditions because of their possible concealment by obesity. Crawford, too, cautions that beyond the parameters of classic presentations of obvious congenital disorders of infancy, hypotonia may be missed. Congenital hypotonia may be seen in tandem with joint hypermobility or ligamentous laxity, but, excluding obvious dysmorphic presentations, hypermobility may not be diagnosed until children are school-aged and present with arthralgia, back pain, abnormal gait, or joint deformity. Knees, elbows, wrists, metacarpophalangeal joints, and ankles are most commonly involved, according to British arthritis researchers, who collected data during a three-year period from pediatric rheumatology and hypermobility clinics.12 Nearly half of the study participants were described in their clinical history as “clumsy,” and more than a third showed signs of poor coordination in early childhood. Joint hypermobility, if associated with hypotonia, may be indicative of Marfan syndrome, Ehlers-Danlos syndrome, osteogenesis imperfecta, or other mild variants of these and other musculoskeletal or connective tissue disorders. Some studies acknowledge that objective measurement of the degree of hypotonia in an individual poses a challenge because, historically, therapists have defined resistance subjectively based on their methods and areas of expertise. Reliable tools, such as the 2011 Segmental Assessment of Trunk Control (SATCo),15 which measures discrete levels of trunk control in children with motor disabilities, are being developed. Ting was soon crawling and pulling to stand, but her feet were profoundly pronated, her foot ligaments were lax, and her wide stance imposed further pronatory forces on her forefeet. Cusick fitted her with heel cups and sturdy flat-soled sneakers, and Ting was soon cruising. At age 5 years, she began gymnastics; at 6, she started soccer; and at 15, Ting became a competitive cheerleader. In caring for patients with low muscle tone or ligament laxity, Cusick relies on management strategies that improve functioning joint alignment and raise the level of—and improve the quality of—sensory input in daily life. 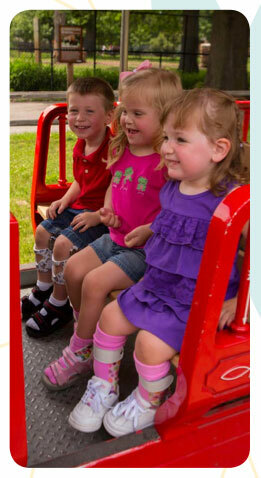 To support these goals, she developed TheraTogs, a live-in orthotic undergarment and strapping system for children with hypotonia and other issues that is designed to deliver enhanced sensory input and improve postural alignment, and can be used in conjunction with orthotic devices that specifically target the foot and ankle. She also selects play activities that build balancing skills, muscle strength, and muscle tone, while maintaining the feet, trunk, and hips in optimum alignment. Christina Hall Nettles is a freelance writer based in Monroeville, AL. Peredo DE, Hannibal MC. The floppy infant: evaluation of hypotonia. Pediatr Rev 2009;30(9);e66-e76. Harris SR. Congenital hypotonia: clinical and developmental assessment. Dev Med Child Neurol 2008;50(12):889-892. Ming X, Brimacombe M, Wagner GC. Prevalence of motor impairment in autism spectrum disorders. Brain Dev 2007;29(9):565-570. Provost B, Lopez BR, Heimerl S. A comparison of motor delays in young children: autism spectrum disorder, developmental delay, and developmental concerns. J Autism Dev Disord 2007;37(2):321-328. Thompson CE. Benign congenital hypotonia is not a diagnosis. Dev Med Child Neurol 2002;44(4):283-284. Lisi EC, Cohn RD. Genetic evaluation of the pediatric patient with hypotonia: perspective from a hypotonia specialty clinic and review of the literature. Dev Med Child Neurol 2011;53(7):586-599. Winders PC. The goal and opportunity of physical therapy for children with Down syndrome. Down Syndrome Quarterly 2011;6(2)1-4. Winders PC. Early therapy in Down syndrome. Pediatric News 2007;41(9)1. Clayton-Smith J, Laan L. Angelman syndrome: a review of the clinical and genetic aspects. J Med Genet 2003;40(2):87-95. Lewis CL. Prader-Willi syndrome: A review for pediatric physical therapists. Pediatr Phys Ther 2000;12(2):87-95. Shim JS, Lee SH, Seo SW, et al. The musculoskeletal manifestations of Prader-Willi syndrome. J Pediatr Orthop 2010;30(4):390-395. Adib N, Davies K, Grahame R, et al. Joint hypermobility syndrome in childhood. A not so benign multisystem disorder? Rheumatology 2005;44(6):744-750. Engelbert RH, Koijmans FT, van Riet AM, et al. The relationship between generalized hypermobility and motor development. Clin Exp Rheumatol2005;23(3):413-420. Martin K, Inman J, Kirschner A, et al. Characteristics of hypotonia in children: a consensus opinion of pediatric occupational and physical therapists. Pediatr Phys Ther 2005;17(4):275-282. Butler, PB, Saavedra S, Sofranac M, et al. Refinement, reliability, and validity of the Segmental Assessment of Trunk Control. Pediatr Phys Ther 2010;22(3):246-257. Wolf JM, Cameron KL, Owens BD. Impact of joint laxity and hypermobility on the musculoskeletal system. J Am Acad Orthop Surg 2011;19(8):463-471.